It wasn’t very long ago that Cobra was a bit of an afterthought when it came to golf clubs. They weren’t really for the serious players, and they seemed a little bit gimmicky. I always thought the logo was cool, but that’s about all they had going for them. Well, those days are long gone. They’ve taken a very different path from companies like Nike. They’ve started to become a trusted brand by even the best players. 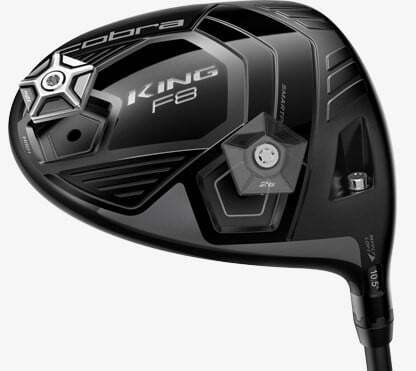 The Cobra King F8 (including the the F8, F8+, and F8 Tour) is an incredible looking club and below we’ll see the features it provides. The very first thing I noticed about this club is the unique face. Cobra has developed the first CNC Precision Milled Face on their F8. This face has “E9 Technology” which means the club has a more precise face thickness which allows them to create a driver with a thinner and thus a faster conforming face than ever before. The thin, light face allows the face to deliver an increased level of deflection through impact; increasing ball speed between 1.2 to 1.6 mph across the face. You’ll also notice that the face has a circular pattern in the middle where the milling pattern goes in a different direction. This pattern makes the sweet spot more obvious and aesthetically pleasing. Cobra has added aero trips on the crown to create a more streamlined shape which helps with airflow around the club. The crown trips are made of polymer, which is 90% lighter than titanium. It helps improve the club’s aerodynamic performance while simultaneously raising the center of gravity. The F8 is designed in such a way that it reduces drag, which increases swing speed, and adds more yards to your drives. The crown of the F8 is carbon fiber, meaning they’ve saved weight to improve launch and forgiveness. As with so many drivers, the Cobra F8 features a level of customization based on their weighting system. The F8 has a back and heel weight that can change your trajectory and spin to maximize your distance. The back weight promotes a higher ball flight, while the heel weight is for a lower launch. Not only that, but the shaft features eight loft settings to increase the launch by +/- .5 degrees and the spin by +/- 400 rpms. The ability to change spin rates by up to 400 rpms is an interesting feature I haven’t seen on many clubs yet, but it’s definitely a nice add on. Cobra offers three main shafts for the F8. This simplicity makes the shaft selection process a little less overwhelming. They provide a shaft for slower swing speeds that helps get the ball in the air with straighter ball flights; the MRC Tensei CK Blue 50. Also, there’s a shaft for mid to high swing speeds for medium trajectory and spin; the Aldila NV 2KXV Blue 60. Finally, there’s a heavier shaft for those wanting a lower ball flight and lower spin; the Aldila NV 2KXV Green 65. One final feature of the Cobra F8 that is incredibly unique is their Cobra CONNECT system powered by Arccos. This allows you to track your driving distance and accuracy with detailed stats that connects directly to a smart phone app. So, you’ll be able to see if all the features in the F8 are actually helping you to hit it farther and straighter. And, you can experiment to find the settings that are working best for your swing style. This might’ve been my favorite part of this driver. Cobra isn’t shying away from showing you exactly what you’re doing with their club. Overall, the Cobra F8 line has earned Cobra a fresh look.